Earlier this month the Food and Drug Administration (FDA) and Environmental Protection Agency (EPA) released updated consumer guidelines on fish consumption. The two agencies said that because of the important developmental and health benefits, pregnant and breastfeeding women, those who might become pregnant and young children should eat 8-to-12 ounces (2-3 servings) a week of fish varieties that have lower levels of mercury contamination. However, the government’s new advice provided inadequate guidance on which fish species have both lower mercury and greater nutritional benefits. It also ignored the findings of scientific studies published since 2004, when FDA and EPA issued their last advisory on fish consumption. The FDA/EPA guidelines and statements to the media suggested that nothing new has been learned in the past decade about the dangers of methylmercury. The agencies emphasized recent studies demonstrating the neurodevelopmental benefits of fish consumption by pregnant women but referred only to “basic” knowledge about the adverse effects of methylmercury. In fact, more than a dozen epidemiological studies over the past 10 years (four of them in the U.S.) have documented that the fetus can be harmed by prenatal methylmercury exposure in amounts similar to or only slightly above the typical levels in American consumers. Several of these studies confirmed both the beneficial effects of eating fish and the adverse effects of too much methylmercury. Women who eat more fish have smarter babies, but only if they also keep their mercury intake low. Babies whose mothers were in the top 10 percent or so of methylmercury intake showed net adverse effects to their cognitive development. In terms of IQ, the harm done by the mercury outweighed the nutritional benefit of consuming fish. Even in children whose overall health benefited from fish consumption, mercury exposure reduced the potential cognitive gains. Some people are genetically much more vulnerable than others to the adverse effects of methylmercury. Many types of seafood normally contain only traces of mercury. However, the new advisory does not provide accurate advice about either the nutritional value of various species or avoiding those with higher mercury content. In fact, there is no bright line between “safe” and “unsafe” exposure to methylmercury. The risk is proportional to the dose, but in general, the lower, the better. EPA calculated a limit (“reference dose”) for mercury ingestion in 1999. It based its guideline on a study that found definite harmful effects of methylmercury at a level of 58 micrograms per liter (µg/L) in newborns’ umbilical cord blood. It calculated that an average weight woman (60 kilograms or 132 pounds) could ingest up to 42 micrograms of methylmercury a week without any harmful effects to her fetus. Recent research has shown that the harmful effects of methylmercury occur at much lower doses than previously documented. In light of this evidence, the question now is how much mercury exposure is acceptable during pregnancy? This is a judgment that EPA and FDA have failed to make explicitly, even though the adverse effects are known to occur in about 10 percent of the American population. Recent scientific findings suggest to us that the reference dose is at least 50 percent too high. To stay within the target we calculated, a woman of average weight can ingest only about 21 µg of methylmercury per week. If she follows government’s dietary recommendations and eats 12 ounces of seafood a week, she would need to choose species that average about 0.05 ppm to stay under the limit. If she eats only 6-7 ounces a week, those levels could average up to 0.1 ppm. 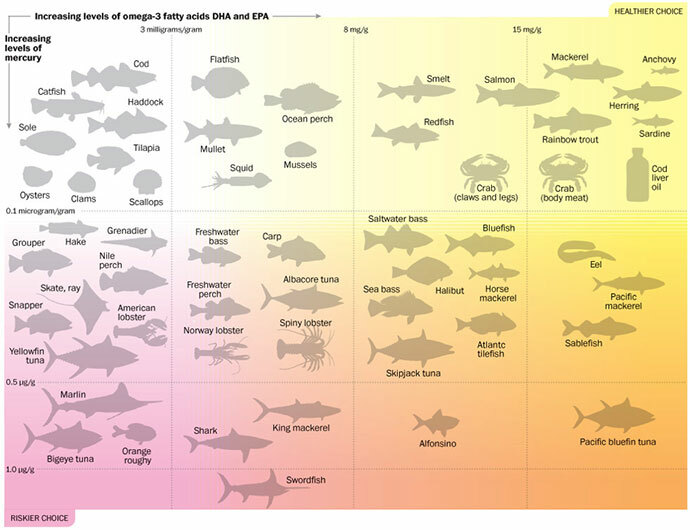 Many commercial seafood species have too much mercury to be eaten more than once a week. Both mercury levels and amounts of beneficial omega-3 fatty acids vary widely from one seafood variety to the next (Appendix A). The EPA and FDA have listed four high-mercury fish to avoid and nine popular “lower mercury” seafood choices, but this list is incomplete and misleading. Two are not low in mercury. A pregnant woman who frequently eats either canned light tuna (see below) or cod risks elevated methylmercury exposure. Seven of the recommended species are poor sources of beneficial omega-3 fatty acids. Pregnant women would need to eat 5-to-20 servings a week of these species to get the recommended amount of omega-3 fatty acids. One of the recommended species, salmon, has high levels of omega-3 fatty acids. A single serving can provide a pregnant woman with her entire recommended weekly amount. However, FDA/EPA should have noted that there are other high-omega-3, lower-mercury choices, including anchovies, herring, mussels, sardines and trout. In addition, the new government advice ignores the fact that some fish may also contain other pollutants. More than one-third of Americans’ exposure to methylmercury comes from tuna, because tuna is fairly high in mercury and Americans consume it frequently. However, the FDA and EPA stuck to their 2004 advice that a pregnant woman can safely eat six ounces of canned albacore tuna a week and that light tuna is a “low-mercury” fish. The agencies ignored the fact that consuming a single 6-ounce serving of albacore tuna a week significantly exceeds EPA’s safe limit (reference dose). Albacore tuna also poses a risk to children. Canned light tuna has less methylmercury, but it provides far less omega-3 fatty acids and thus is not a suitable alternative for pregnant women. Pregnant women and children should not eat more than one serving of canned light tuna a week. About 5 percent of Americans already meet or exceed the EPA/FDA’s recommended fish intake (8-to-12 ounces per week) and about 10 percent of women of childbearing age have blood mercury levels above 5 µg/L. That is the level known to be associated with net adverse effects on cognitive development. The recent FDA/EPA guidelines failed to warn people who eat fish often that the more fish they eat, the more they should pay attention to choosing low-mercury varieties. The risks posed by other persistent contaminants also add up for frequent fish consumers. Women of childbearing age and parents of young children especially need this advice. They need detailed information about the relative mercury content of various seafood choices so they can keep their mercury exposure within safe limits. Source: Joint FAO/WHO Expert Consultation on the Risks and Benefits of Fish Consumption. Patterson Clark/The Washington Post. Published on April 3, 2012.